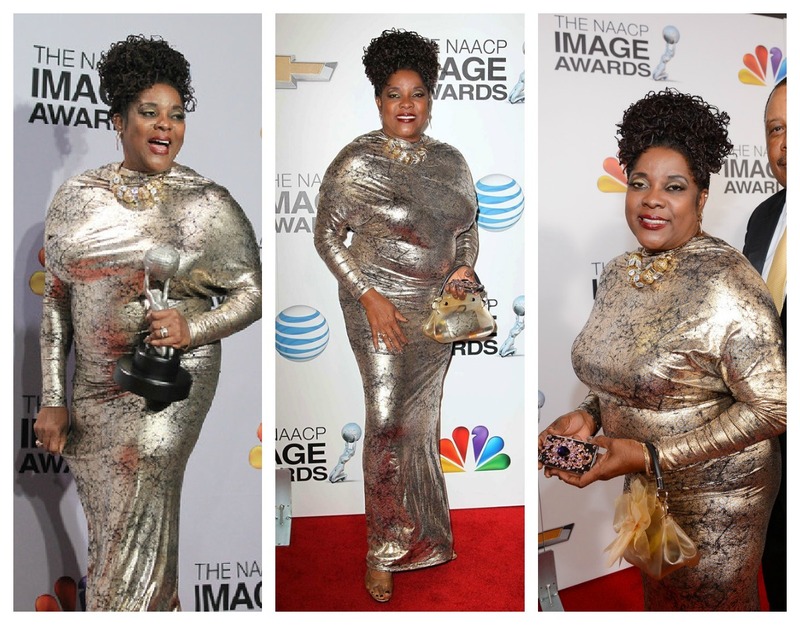 So last week I caused a Facebook war on my page when I commented on actress Loretta Devine’s choice of wardrobe for her NAACP appearance. Oh hunny I was told that I was putting another woman down and that I have no fashion sense basically. I just had to laugh at those comments because some people tend to forget that not only have I taught plus-size classes but I’ve also hosted and styled fashion shows. (Not to mention I’ve dressed a star or two as well). So in no way do I bash the curvy community. Meanwhile as I looked over my previous status updates, all I seem to do is put up uplifting quotes, give props to people, even when I don’t get it in return, and share fashion knowledge on my page. I know for sure when curvy celebs such as Queen Latifah, Beth Ditto, Amber Riley and Octavia Spencer get it right on the red-carpet I’m the first to give props to them. Funny thing is usually I never post how I REALLY feel when an outfit is atrocious but rather I just comment on the best dressed. I never wanted to “step on anyone’s toes”. But for some reason I couldn’t hold my thoughts on this Loretta ensemble. I felt so taken back as a plus-size woman. There are just SO MANY plus-size designer options available now for this to be happening on the red-carpet. We should all know our bodies and what works for us and what doesn’t. Now I’m not perfect and can admit to some fashion mistakes myself but when on the red-carpet one must REALLY step their game up. Honestly, I’m shaped almost just like Loretta but you would probably never know it. I have large breast, a pouch and I don’t have a Kim Kardashian booty either. But I make sure to put on a girdle, body magic or some sort of shapewear before I wear anything clingy. From the look of Loretta’s dress she didn’t seem to have been wearing any shapewear. A woman with that type of body proportion should stick to dresses that flow from the waist or have some type of ruching. So below I’m sharing some choices that I believe would have worked great for Loretta that night. Curvy fashion bloggers and wardrobe stylist such as myself who study this fashion world day in and day out work too hard for to not get noticed. What I mean by that is if a wardrobe stylist who really knows the curvy world were to have dressed Loretta I bet this would have never happened. Let me just speak for myself when I say that plus-size designers such as IGIGI, Monif C., Qristyl Frazier, Shanda Freeman and Curvysta, just to name a few, all have red-carpet worthy apparel. But a regular ‘ole stylist who may just work with the average slender client all the time wouldn’t necessarily be privy of that knowledge. I bring all of this up to say that after watching the Grammy Awards on Sunday night, once again I was baffled at the red-carpet choice for curvy starlet Adele. At first glance I was like wow, she didn’t wear all black for a change. Then as the night went on and I kept seeing different pics of her, the more I realized that her dress choice print was a bit too ‘busy’ for her frame. Yes, full-figured ladies ‘CAN’ wear prints but I think a black wide-belt and black pumps were needed with this one to break up the busy pattern a little bit. Now mind you, I have nothing wrong with a curvy woman wearing all black, but Adele used to seem to hide in black gowns. But now that she has stepped out in color, it was all wrong. Adele was wearing a dress by designer Valentino who is in no shape or form a plus-size designer. 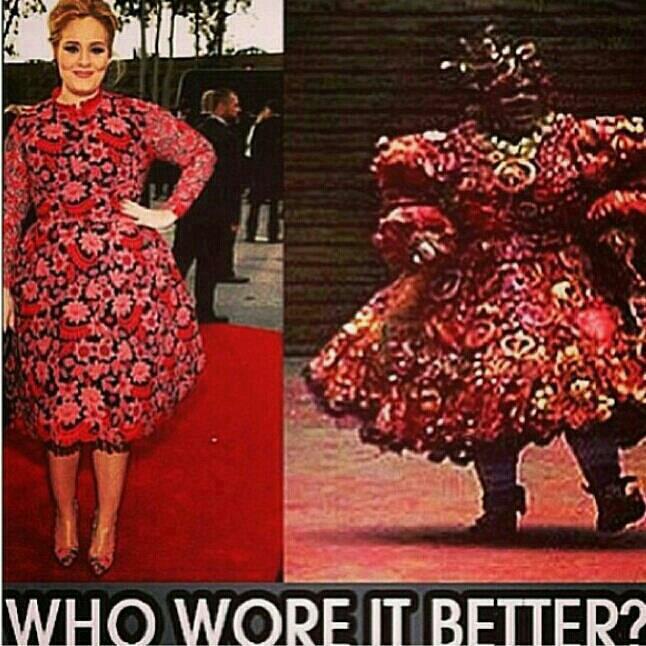 There were many jokes and funny pics floating around the web comparing Adele’s dress to that of Mrs. Doughtfire and also a character from “The Wiz”. (All were funny by the way, sorry). So below I share a few choices that I think would have worked for Adele and I even added a couple of black choices since she seems to be comfortable in that color mostly. But the black dress options that I chose were figure-flattering and worthy to win awards in! More simply put … While Good Taste is Subjective … these Pics Don’t Lie! Okay people have differing views and tastes, … however it’s hard to be positive about their choices! We all make our share of mistakes, me More than Most! Each of us know what works best for ourselves and had they took a Honest Look at themselves I doubt they would have chosen to wear them! As I said on fb Adele’s was just too busy for her! Loretta’s people should have told her it was Wrong for her! How often have I said Bella can Help Women of All Sizes? Better to have a Good Friend to be Honest than have Yes People in your corner! Some folks will Never Admit they (outfits/stylish/comments were all Wrong! It’s easier to lay the Blame on … You! I agree with you. If we are into fashion, we should try to look our best and pick clothes that make us look AND feel good. I do think that we plus size women have to push the boundaries somewhat in order for others to realize that we can look good in stylish clothes. But if you wear something that looks bad on you because it doesn’t fit or would look good on very few (or probably no one) you aren’t really helping to push those boundaries…you’re just not looking your best. Thank you for adding my 3D vinyl mermaid gown to your list of suggestions. I love both of them and would love to style them. Ms. Devine needed stronger undergarments and a better custom fit. I love Adele and love the dress she chose, I just would’ve added something to cinch her waist more. I think Adelle’s dress should have been altered to your #4 dress, to hug her curves. Then, she would have gotten compliments left and right; but without the skirt around the waist. Girl, you are so right. I saw Ms. Devine and I couldn’t believe my eyes. I really felt so sorry for her because that was a wonderful night and she could have been dressed more chic and been more comfortable. I don’t believe a thinner woman could have pulled off that material. I hope people understand that you were coming from a good place and not a bashing one. The truth is what is it and that dress was a hot mess. I didn’t understand Adele’s gown choice either because all of the other times she’s been dressed in beautiful black dresses that complimented her body type. Oh, well everyone has their off days but it is unfortunate when it take place in front of the camera. I think both Adele’s and Loretta’s dresses were fabulous. And although I like the dresses you suggested as alternatives, I don’t like the idea that women with a particular body shape should stick to certain styles! The only “should” I believe in is that people should wear what makes them feel fabulous, period. Agreed. 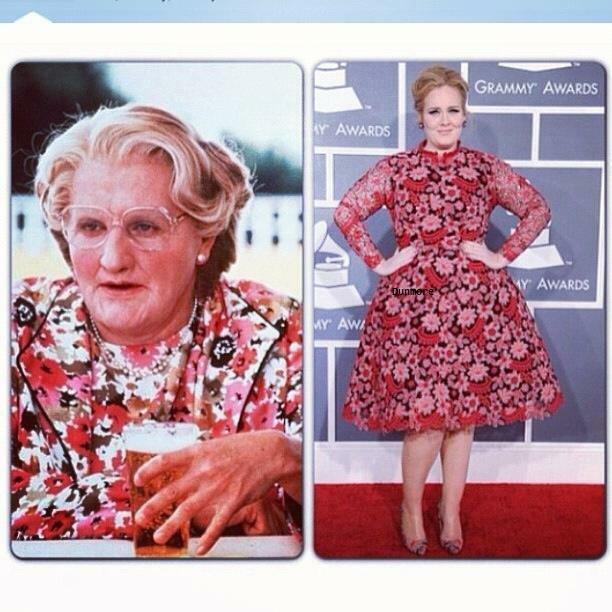 I loved Adele’s dress to death. But don’t we all blog about fashion to share our (different!) opinions? It wasn’t fair for you to be attacked for viewing yours! Lets embrace that we all have different views on fashion!